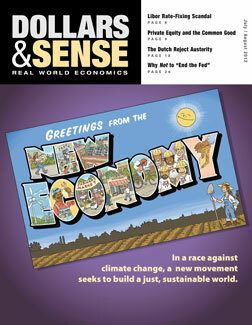 Dollars & Sense is a unique publication, tackling economic issues in plain English for readers with a commitment to social and economic justice. Since 1974, Dollars & Sense has been a leading source for under-reported news and critical analysis. With a circulation of over 2,000, and an estimated per-issue readership of over 4,000, Dollars & Sense reaches a committed readership of activists, organizers, students, professors, journalists and others who are deeply concerned with economic issues. Our readers buy books and magazines, attend professional conferences, join and support activist organizations and activities, and travel widely. Dollars & Sense is published six times a year in Boston, Mass., by the non-profit Economic Affairs Bureau Inc.
* Full-page back cover ads are trim size—add 1/8-inch bleed on left, right, and bottom. Prices are for black and white ads. Two- and four-color ad placements can be arranged, subject to space availability. For more information, please call Linda Pinkow at 617-447-2177, or . Last-minute placements are sometimes available; please call us to check. Please call 617-447-2177, or to reserve your space. All ads must be prepaid. For black and white ads, you may submit a color version of your ad in addition to the black and white version. The color ad will be used in the digital issue of Dollars & Sense. If possible, display ads should be submitted as PDF files. Quark Xpress and Pagemaker can export directly to PDF; with other programs you may have to create a Postscript file and distill it. If you don't have Acrobat Distiller, you can submit your file in PS (Postscript) or EPS format. In either case, please make sure that all fonts are embedded and that all graphics are high resolution—at least 600 dpi for line art, 200 dpi for grayscale. You can check font embedding in Acrobat Reader (under Document info in the File menu). To check graphics, print out the PDF file—graphics should not look fuzzy, jagged, or pixelated.